The dance-drama "Tachi Nusubito" was premiered in July 1917 at the Ichimuraza. It was a kyôgen (comical farce in the Nô theater) adapted for Kabuki by Okamura Shikô with a musical accompaniment written by Kineya Mitarô V. Onoe Kikugorô VI, Bandô Hikosaburô VI and Bandô Mitsugorô VII play the 3 roles of the dance. One day Kurobê's eye catches sight of Manbê's sword, which is made of gold. Although Manbê is very cautious, Kurobê eventually manages to quietly remove the sword from Manbê in a crowd. When Manbê finds his sword missing and notices Kurobê wearing it, a loud dispute ensues. At the sound of their clamor, a magistrate named Saemon and his assistant, Tônai, appear. Both Kurobê and Manbê insist that they are the rightful owners of the sword. 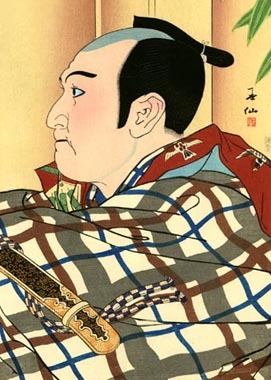 After taking possession of the sword, Saemon declares that he will settle the matter by asking a few questions in order to decide who the true owner is. The real owner of the sword should be able to answer correctly. Saemon adds another condition, they should also perform a dance which has a deep relation with the sword in question. The examination begins. Saemon tests Manbê first and then asks Kurobê the same questions. Thus Kurobê, having overheard Manbê's answers, can easily respond. He also follows Manbê's example when it comes to the dancing. In this way, Kurobê gives a convincing performance until Manbê realizes that he is aping him. After realizing the thief's strategy, he begins speaking in a low voice and dancing so as not to be seen by the other man. Kurobê finds himself unable to continue the deception and thereby reveals his identity.